Learn drumming essentials with this comprehensive book, DVD, and CD program. 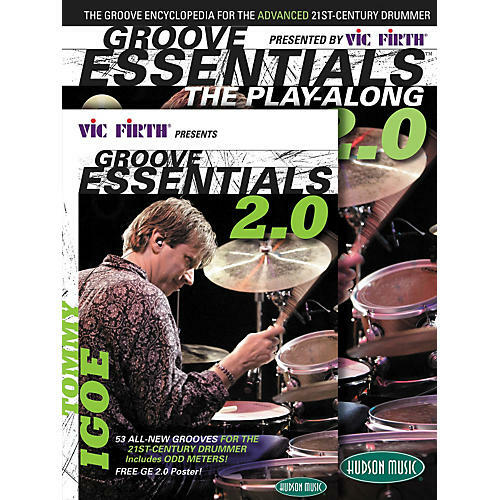 Groove Essentials 2.0, the second edition of the best-selling original Groove Essentials features an instructional book and CD package as well as a DVD with 53 drum grooves and over 100 variations for intermediate to advanced players. Drummers will learn the difference between ghost and grace notes (while being encouraged to experiment with both in all six groove "families") as well as important "go-to" grooves, like the Train and Bo-Diddley beats. For more advanced players and professionals, GE 2.0 introduces the concepts of groove construction, interpretation and manipulation, training drummers to think like musicians in order to maximize their full potential. The DVD features more than 70 songs covering 4/4, 2/2, 6/8 and 3/4 time signatures, with three levels of difficulty for 5/4, 7/8 and 9/8 meters. On the 3-hour, 45-minute DVD, Tommy Igoe discusses and demonstrates each groove in multiple tempos, alone and with a band, with many patterns shown on both acoustic and on Roland HD-1 and TD-9 electronic drumkits. The grooves span rock, funk, RandB/hip-hop, jazz (sticks and brushes), world/specialty, extreme tempos, all-purpose, hybrid, rideless, classic and odd-meters. The companion play-along book and CD contain over 90 tracks, including every song from the DVD in their full-length versions, minus the drums, allowing drummers to expand their skills by playing any of the grooves with a band and recording themselves on audio or video (optional) to help facilitate the learning process. These play-along tracks also supply a variety of fill-in and soloing opportunities to challenge advanced players. In addition, the book features Tommy Igoe's extended "global tours" that will test even the most seasoned professional's chops, creativity and stamina and, as a "first of its kind" bonus, there is a full-length orchestral play-along track designed to provide a taste of playing in a full orchestra, complete with multiple moving tempos, dynamics and feels. Add this book, DVD, and CD pack to your cart today and save!